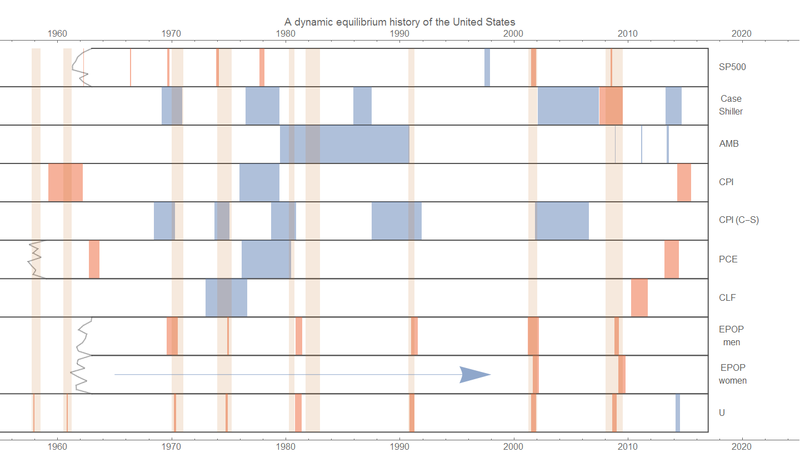 In writing the previous post, I got the idea of collecting all of the dynamic equilibrium results for the US into a single "infographic". 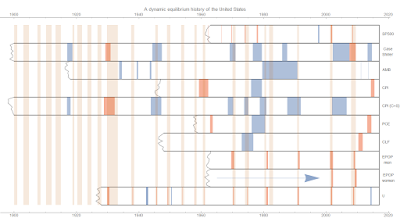 It was also inspired by the recently scanned 75 Years of American Finance: A Graphic Presentation, 1861-1935, the 85-foot long detailed timeline compiled by Merle Hostetler in 1936 available at FRASER. 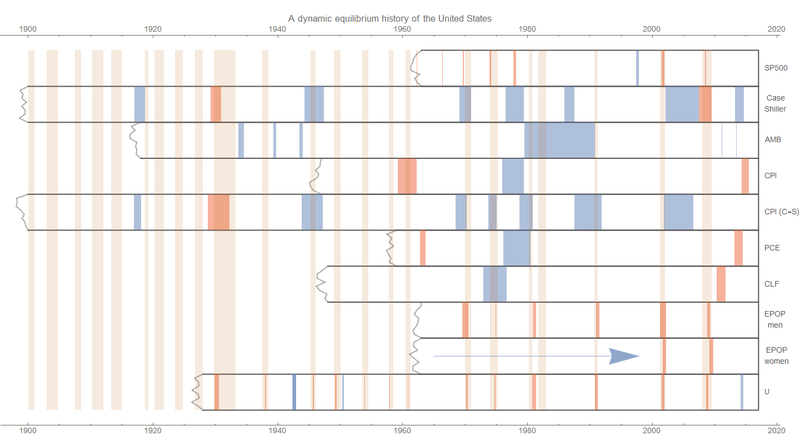 Hopefully the chart is fairly self-explanatory: positive shocks in blue, negative shocks in red, recessions in beige. The "tapes" indicate the range of data analyzed with the dynamic equilibrium model. The widths of the bars are proportional to the widths of the shock (roughly, the 1-sigma width). U is the unemployment rate. CLF is the civilian labor force (participation rate). EPOP is the employment-population ratio (for men and women). PCE is the personal consumption expenditures price index. CPI is the consumer price index (all items), and C-S is the version available with the Case-Shiller data (see here). The Case-Shiller housing price index itself is included along with the S&P 500. AMB stands for adjusted monetary base. The arrow indicates the non-equilibrium process of women entering the workforce (where I didn't try to decouple the recession shocks from the broad positive shock). I'll leave the possible narratives to comments. 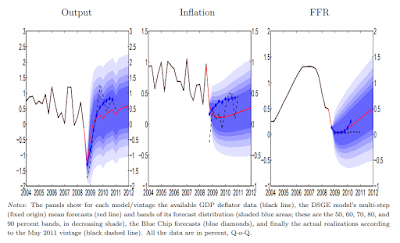 Unemployment shocks are preceded by PCE inflation shocks such that as unemployment recovers from the previous shock, inflation rises (unemployment goes down, inflation goes up, and because an inflation shock is ending when unemployment rises, inflation is going down when unemployment is going up). That goes for the recessions of the 70s, 80s and 90s. However, the early 2000s recession doesn't have a distinct shock (at least one that the algorithm can find in the data), and the Great Recession is preceded by a fairly small shock relative to the previous ones. And even if it wasn't fading away, the causality is uncertain here. It could well be from unemployment to inflation and not the other way around (i.e. low unemployment causes inflation, but inflation doesn't cause unemployment). I updated all the figures with more accurate versions of the widths and years (I had read some of them off the relevant graphs). I also increased the font size a bit and the image sizes because some of the lines are too narrow to show up except on a big image. Does information equilibrium add information?